After receiving an advanced double BA in History and Philosophy from Dalhousie University (Canada) Rabbi Joshua Ross spent eight years learning in Israel. Following his decision to join the Orthodox Union's Jewish Learning Initiative on Campus, Rabbi Ross returned to the US with his family where he worked at Cornell as the OUJLIC Rabbi for three years, and then went to work as the OUJLIC Rabbi at Princeton University for three more years. Continuing his affiliation with OUJLIC, but on an administrative level, he is the Deputy Director for the OU’s JLIC. In his spare time Rabbi Ross is a powerlifter and strength and conditioning coach. Our forefathers went through tremendous transitions throughout their lives dealing with both national and personal hardships. Did they ever waver in their faith? Was the promise God made to them that their descendants will be like the stars in the sky and the sand on the seashore real in their eyes? In this course we will explore the evolution of the Avot, their relationships with God, and what we can learn about ourselves from their experiences. In this course we will develop Talmud-learning skills through the study of the fourth chapter in Tractate Brachot. We will learn how to read the text with the help of the commentators to reach a better understanding of what the rabbis were trying to teach us. We will begin by familiarizing ourselves with what the gemara IS and where it comes from and it's place in our tradition. After that we will focus on building essential skills and Aramaic know-how to allow participants to eventually learn on their own. If you're a beginner who has always been intimidated by learning the Talmud, this is the class for you! What is the Mishna? How can it help us understand the Talmud? This introductory course is concerned with imparting to the students a basic understanding of the nature of Torah Sheba'al Peh (Oral Law) and Mishna, the first text of the Oral Law. The two focal points of the course are: firstly helping the student to achieve a mastery of reading of the text, and secondly an introduction to conceptual analysis. This semester we will be studying Tractate Ta'anit. Why do we pray what we pray? In this course we will take an in-depth look at the brachot of the Shmonah Esrei and how they relate to each other. Who were the Rabbis we read about every year on Passover? Join Rabbi Ross in exploring the Rabbis of the Haggada through understanding the sugiya in Berachot with Rabban Gamliel and Rav Eliezer ben Azaria (as well as Rabbi Yehoshua and Rabbi Akiva). This introductory Gemara course is concerned with imparting to the students a basic understanding of the nature of Torah shebaal Peh (oral law) and Mishna - the first text of Oral Law in particular. The two focal points of the course are: firstly helping the student to achieve a mastery of the reading of the text and secondly an introduction to conceptual analysis. This semester we will be studying Tractate Megilla. This course has been dedicated in loving memory of Mrs. and Mr. Judith and Maurice Kandel, by the Kandel Family. 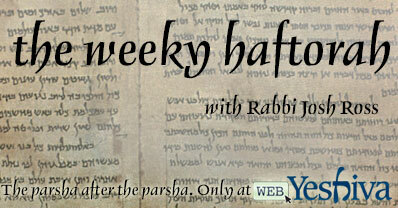 Join us each week as we analyze the haftorah read alongside the parsha. A study of Jewish women and their role in getting the Jewish People from Egypt to Eretz Yisrael. We will look at some of the midrashim that discuss how we all would have been lost without the Jewish women and their role in Egypt, the sin of the Golden Calf, and more. Join us each week as we analyze the haftorah read alongside the parsha. For previous lessons please click here. This introductory Gemara course is concerned with imparting to the students a basic understanding of the nature of Torah shebaal Peh (oral law) and Mishna - the first text of Oral Law in particular. The two focal points of the course are: firstly helping the student to achieve a mastery of the reading of the text and secondly an introduction to conceptual analysis. This semester we will be studying Tractate Megilla. This class is a continuation from a previous shiur, although new students are encouraged to join. Please click here for the past classes. Never looked at a daf before? Not even totally clear what Gemara is or where it comes from? This course lays the groundwork for a better understanding of what Gemara is, how it has evolved and what it means to learn it. We will break down all the history, all the rabbis and all the commentators and learn who they are. This class will lay foundation for a beginner Gemara shiur and set you up for success as you start to learn. No Gemara skills or Hebrew required. This class is for the beginners beginner and for anyone who is curious. This course is a continuation from Winter 5773, but new students are welcome to join. Never looked at a daf before? Not even totally clear what Gemara is or where it comes from? This course lays the groundwork for a better understanding of what Gemara is, how it has evolved and what it means to learn it. We will break down all the history, all the rabbis and all the commentators and learn who they are. This class will lay foundation for a beginner Gemara shiur and set you up for success as you start to learn. No Gemara skills or Hebrew required. This class is for the beginners beginner and for anyone who is curious. The course is concerned with imparting to the students a basic understanding of the nature of Torah shebaal Peh (oral law) and Talmud. The two focal points of the course are: firstly helping the student to achieve a mastery of the reading of the text and secondly an introduction to conceptual analysis. The units to be studied will be taken from the first chapter of Tractate Makot. This class will study Sefer Shmuel Bet (The Book of Samuel II), with relevant commentaries. Students will learn to think about the text themselves, and what the narratives mean, as well as hone their skills in exegesis. Where relevant we will take a more b'iyun (in depth) approach to some of the subjects, looking at a broader range of sources including Talmud, Rishonim and Achronim. Now that you've learned the Book of Shmuel with Rabbi Ross (or if you're interested to find out some background before you start learning), it's time to meet the characters one-on-one. This semester, Rabbi Ross will introduce us to the main players of the Book of Shmuel: Chana, Shmuel, Shaul and David. Who were the Rabbis we read about every year on Passover? Join Rabbi Ross in exploring the Rabbis of the Haggada through understanding various sugyas in the Gemara Pesachim. Throughout the course, students will also gain a basic understanding of the nature of Torah shebaal Peh (oral law), as well as develop textual skills. This class will study Sefer Shmuel (Samuel), with relevant commentaries. Students will learn to think about the text themselves, and what the narratives mean, as well as hone their skills in exegesis. Where relevant we will take a more b'iyun (in depth) approach to some of the subjects, looking at a broader range of sources including Talmud, Rishonim and Achronim. This introductory Gemara course is concerned with imparting to the students a basic understanding of the nature of Torah shebaal Peh (oral law) and Mishna - the first text of Oral Law in particular. The two focal points of the course are: firstly helping the student to achieve a mastery of the reading of the text and secondly an introduction to conceptual analysis. This semester we will be learning Masechet (Tractate) Sukkah. This introductory Gemara course is concerned with imparting to the students a basic understanding of the nature of Torah shebaal Peh (oral law) and Mishna - the first text of Oral Law in particular. The two focal points of the course are: firstly helping the student to achieve a mastery of the reading of the text and secondly an introduction to conceptual analysis. This semester we will be studying Tractate Kedushin. This class will study Sefer Shmuel Bet (Samuel II), with relevant commentaries. This class will study Sefer Shmuel (The Book of Samuel), with relevant commentaries. Students will learn to think about the text themselves, and what the narratives mean, as well as hone their skills in exegesis. Where relevant we will take a more b'iyun (in depth) approach to some of the subjects, looking at a broader range of sources including Talmud, Rishonim and Achronim. This introductory course in the Gemara is concerned with imparting to the students a basic understanding of the nature of Torah shebaal Peh (oral law) and Mishna - the first text of Oral Law in particular. The two focal points of the course are: firstly helping the student to achieve a mastery of the reading of the text and secondly an introduction to conceptual analysis. This semester we will be learning the Gemara Brachot, the 4th perek - Tefilot Hashachar. The Mishna course is concerned with imparting to the students a basic understanding of the nature of Torah shebaal Peh (oral law) and Mishna - the first text of Oral Law in particular. The two focal points of the course are: firstly helping the student to achieve a mastery of the reading of the text and secondly an introduction to conceptual analysis. The units to be studied will be taken from the Masechta that the Yeshiva is learning. This Gemara course is concerned with imparting to the students a basic understanding of the nature of Torah shebaal Peh (oral law) and Gemara - the main text of Oral Law in particular. The two focal points of the course are: firstly helping the student to achieve a mastery of the reading of the text and secondly an introduction to conceptual analysis. The units to be studied will be taken from the Masechta that the Yeshiva is learning. This class will examine the concept of teshuva as learnt through the people and stories of the tanach. We will examine what it means to do or not to do teshuva, learning from everyone from Adam and Chava to Shaul and David. The Mishna course is concerned with imparting to the students a basic understanding of the nature of Torah shebaal Peh (oral law) and Mishna - the first text of Oral Law in particular. The two focal points of the course are: firstly helping the student to achieve a mastery of the reading of the text and secondly an introduction to conceptual analysis. The units to be studied will be taken from the Masechta that the Yeshiva is learning. PLEASE NOTE: This class requires a minimum of 10 paying students in order to ensure its continuation this zman. This beginner Gemara course is concerned with imparting to the students a basic understanding of the nature of Torah she’bal Peh (oral law) and Gemara . The two focal points of the course are: firstly an in depth look at just what the Gemara is, placing it in historical context - how it evolved and was edited as well as understanding the layout of the page and how mefarshim (commentators) were chosen . Secondly it will help the student to achieve a mastery of the reading of the text and act as an introduction to conceptual analysis. The Mishna course is concerned with imparting to the students a basic understanding of the nature of Torah shebaal Peh (oral law) and Mishna - the first text of Oral Law in particular. The two focal points of the course are: firstly helping the student to achieve a mastery of the reading of the text and secondly an introduction to conceptual analysis. The units to be studied will be taken from the Masechta that the Yeshiva is learning. Please note that this class requires a minimum of 7 paying students in order to proceed. If this number is not reached, the class may be discontinued. This class will study Sefer Shmuel (Samuel), with relevant commentaries.Â Students will learn to think about the text themselves, and what the narratives mean, as well as hone their skills in exegesis. Where relevant we will take a more b'iyun (in depth) approach to some of the subjects, looking at a broader range of sources including Talmud, Rishonim and Achronim. Please note that this class requires a minimum of 7 paying students in order to proceed. If this number is not reached, the class may be discontinued. The Mishna course is concerned with imparting to the students a basic understanding of the nature of Torah shebaal Peh (oral law) and Mishna - the first text of Oral Law in particular. The two focal points of the course are: firstly helping the student to achieve a mastery of the reading of the text and secondly an introduction to conceptual analysis. The units to be studied will be taken from the Masechta that the Yeshiva is learning. Although preferred, it is not absolutely necessary to have a working mic to take a WebYeshiva class. However with beginner mishna, while anyone and everyone should feel welcome to join, it is strongly recommended that you have a mic available. Because of the nature of beginner learning, it is very important that you be able to participate fully in this class, which will also focus on your ability to read a mishna and discuss it. A Jew's relationship with God is often compared by the sages to the relationship between a father and child, while at others times it is compared to that of a husband and wife. This course will look at some of the relationships in the parshiot we read during the High Holidays to gain an insight to our relationship with God. In particular we will look at the behavior of the Avot and Emmahot, and the relationships between husband and wife, and parents and children as expounded upon in the Talmud, Midrash and commentaries on the Chumash. From November 8th-22nd, 2009. This course is no longer available. Jewish daily living is based on the principles and traditions that developed out of the Torah and were expounded upon by rabbis and sages over many centuries. We'll take a look at the concepts of the written and oral Torah (yes, there are two!) their development, and how what is written in the Torah can actually be really relevant to today!